Osvaldo (Ossie) Chavarria's fingers are thick, his palms calloused, his grip firm. His are a working man's hands. He has always earned his keep with these mitts, which were busy on a recent sunny weekend afternoon handling indoor chores at the Pacific Coliseum. He secured the arena's many doors by squeezing padlocks tight in his fist. Mr. Chavarria, 68, is a semi-retired jack-of-all-trades who depends on his hands. Back when he was a young man, those same hands took him from his native Panama on a 20-year baseball odyssey that would see him play professionally in five countries, as well as the commonwealth of Puerto Rico. His odyssey eventually brought him to British Columbia and a sports-filled life that recently earned him a place in the Burnaby Sports Hall of Fame. Mr. Chavarria did everything asked of him on the baseball diamond. He played shortstop and second base. He handled first base. He filled in at third base. He patrolled any of the three outfield positions. He pinch-hit and pinch-ran. In one memorable game for the minor-league Vancouver Mounties, he even pitched and played every field position. In baseball parlance, he was a utilityman. Forty years ago this spring, he made his debut with the Kansas City Athletics of the American League. He played 124 games over two seasons in the major leagues — long enough for a player to know he belongs, but not long enough to show all he can do. Mr. Chavarria wore so many uniforms in his career it became hard to keep track. He played for a brewery-sponsored team in his homeland and for minor-league teams in the U.S. Midwest. He was a Mountie in Canada, a Tiger in Mexico City and a Cardinal in Lara, Venezuela. He also had the misfortune of being a black man playing in the U.S. South. It was a time when it was wiser for him to be familiar with the Jim Crow laws of segregation than with the baseball rule book. One of 12 kids born to a realtor in Colon, Panama, the boy played baseball from early childhood. He was scouted in high school and signed as a free-agent amateur with the Chicago Cubs in 1959. The scout had advice: add three years to your birth date, otherwise managers will think you are too old to be a rookie. Even now, many sources list Mr. Chavarria's birth year as 1940, not 1937. He was born a decade before Jackie Robinson ended the colour barrier in major-league baseball. He grew up in a world where a black man could play against Joe DiMaggio or Ted Williams only in an exhibition game. 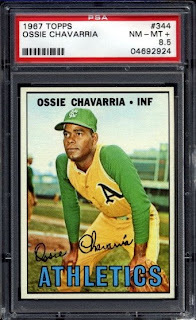 By the time Mr. Chavarria was an adult, blacks and whites competed on the same baseball diamonds, but the white supremacy that marked daily life in the South was far from exhausted. In Florida, he could not stay at the same hotel as his white teammates. On the road, he often had to eat his meals on the bus, even as his white teammates enjoyed a hot meal at a whites-only restaurant. One time, the team bus pulled up to an ice-cream parlour where some 40 youths were gathered. Mr. Chavarria was about to disembark to buy a treat when a teammate intervened, offering to bring him a sundae. Even with 20 players on his side, there was no telling what mayhem might ensue from so ordinary a transaction as a black man trying to buy an ice cream. He credits Martin Luther King Jr. for changing that world. At the time, Mr. Chavarria did his best to suppress his own anger. “I had to get the discrimination out of my mind,” he said. After all, he was trying to win a job in baseball. He knew a Spanish-speaking black man from Panama had to be more-than-equal in skill to beat out a white rival from, say, Oklahoma. He learned to read English from the sports pages and was tutored in the foulest epithets by giggling teammates. He studied the playmaking of his most talented teammates. At 5 foot 11, 155 pounds, he worked hard at transforming his skinny physique into one capable of hitting more than just singles. Baseball offered year-round employment. In spring and summer, he played in the United States. In winter, he played in the winter leagues of warmer climates. He was a top hitter and fan favourite with the Cerveza Balboa Brewers in his homeland, on a sort of “sinners' circuit” in which the other teams were known as the Smokers and the Rummies. Mr. Chavarria first came to Vancouver in 1965 as a demotion. As it turned out, being sent down to the minors was the best thing to ever happen to him. He liked it here so much he chose it as his home, married and raised a family. Among his teammates in Vancouver were future major-league managers Tony LaRussa and Rene Lachemann. In one game against Hawaii in 1968, Mr. Chavarria played every position, much to the delight of the few fans on hand at Capilano (now Nat Bailey) Stadium. When his playing days ended in the mid-1970s, he decided he loved baseball too much to give it up. He became an umpire. In 1992, he handled games at the Summer Olympics in Barcelona, where baseball was a demonstration sport. He still umpires. Last week, he was inducted into the sports hall of fame in suburban Burnaby for his many years behind the plate. He has worked at the Coliseum for the past 26 years, including a stint as an usher when the arena was home to the Vancouver Canucks. Then, as now, his name tag read, simply, Ossie. A recent visitor asked whether he received much congratulation for his recent honour. “Nobody knows,” he says of his baseball career.